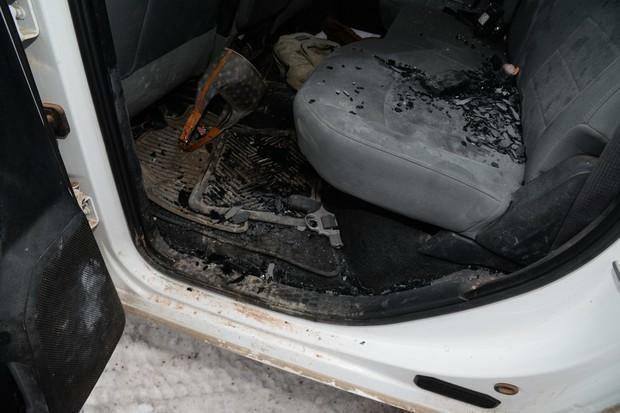 The inside of the vehicle driven by militant leader Robert "LaVoy" Finicum. The Central Oregon Major Incident Team released photos of evidence from Finicum's Jan. 26 killing. The FBI agent charged with obstruction of justice and lying to investigators told jurors in Portland Wednesday that he never fired his weapon during a January 2016 traffic stop that left one of the Malheur National Wildlife Refuge occupation leaders dead. FBI special agent Joseph Astarita told jurors three separate times during his three-hour direct testimony that he never fired during the traffic stop that left Robert "LaVoy" Finicum dead. "Did you fire your rifle on Jan. 26?" defense attorney Robert Carey asked Astarita, referencing the date Finicum was killed. "No, I did not," Astarita responded. Prosecutors say Astarita — a member of the FBI's elite Hostage Rescue Team — fired his weapon twice at Finicum's truck and then lied about it later. Astarita testified that he'd wanted to be an FBI agent since before he was in high school. "It means everything to me. It's my world," Astarita said. "It's my honor." The trial, now in its third week, is drawing to a close and the outcome could have significant weight. For years, anti-government activists have claimed there was a conspiracy to kill Finicum at the refuge. It also comes at a time when the FBI's integrity as an agency is being called into question by members of Congress and President Trump. On Wednesday, Astarita testified about setting up at the roadblock at the direction of his supervisors. He said that he looked through the scope of his rifle as Finicum approached the roadblock, "to see if I could apply effective fire on that driver." "I just couldn't see," Astarita said. He testified he was "glassed out" by a glare. "I couldn't put effective fire there so I stayed in my position," he said. "I heard somebody say, 'Get down, they're shooting.'" He said he didn't hear any shots at the traffic stop where eight rounds were fired by law enforcement. He testified he was wearing ear protection at the time. Astarita said that he saw Finicum in the snow. "I realized he was not complying" with law enforcement's commands, he said. He said he saw Finicum reach into his jacket. Law enforcement later found Finicum was carrying a loaded pistol in his coat. The bulk of Astarita's testimony focused on video footage taken by an FBI surveillance aircraft during the traffic stop and subsequent shooting. During much of his direct testimony, Astarita stood outside the witness stand, in front of the jury box and looked at a monitor. He wore a dark blue suit, white shirt with a red tie and held a microphone in one hand while pointing out things in the surveillance video with his other hand. Defense attorney Robert Carey stopped the video every few minutes to ask Astarita if he could identify himself or others. Initially, Astarita was able to show jurors where he stood. But as more law enforcement arrived on the scene and dusk faded into darkness, it was less clear. "There's a figure bending over at the Oregon State Police vehicle," Carey said. "Are you able to identify who that is?" "No, I cannot," Astarita replied, during one of several similar exchanges. Prosecutors have alleged that after the shooting, HRT members picked up shell casings that were on the roadway. The prosecution says those casings have never been recovered. But defense attorneys argue that the agents were doing what's known as a "sensitive items check" to pick up things used during the traffic stop that could later harm the public. Those would be things like the remnants of flash-bangs. During his direct testimony, Astarita said he did check for sensitive items. He said he found a magazine in the snow; one round had fallen out, the other was loosely inside the magazine. But he testified that he later returned them to their owner. "Did you pick up .308 casings?" Carey asked Astarita about a specific type of spent round. "I did not," he responded. "Did you pick up .223 casings?" Carey asked. "I did not," Astarita said. "Did you pick up any rifle casings at all?" On Wednesday afternoon, federal prosecutors also got their chance to cross-examine Astarita. Assistant U.S. Attorney Gary Sussman asked him to shoulder his rifle in the courtroom for the jury to show how he held it in various positions. When Sussman handed Astarita the rifle, the agent responded that the safety was off. Sussman pointed out there were not rounds in the magazine. "Do what you need to do to make sure that gun is safe," Sussman said. Sussman then asked Astarita to demonstrate his "low ready position" and then his "firing position." With his rifle shouldered, Astarita moved the rifle a few inches lower and then a few inches higher with Sussman's commands. Later, Sussman told Astarita that it was the agent's idea to do a second sensitive items check. "That was your idea," Sussman said. "I don't recall," Astarita said, adding that regardless, it would've been a supervisor's decision. Sussman pointed out that Astarita was a right-handed shooter. And noted that on the video there were only two right-handed shooters looking for items on the ground and under vehicles. "I don't recall looking under vehicles," Astarita said. Astarita also said he didn't know what kind of ammo he had on Jan. 26. "I don't remember the make or model," he said. Sussman eventually came back to the eight shots that were fired. "You didn't hear any gunshots?" Sussman asked. "I didn't hear any gunshots," Astarita responded. With that Sussman ended his cross and Astarita got down off the witness stand. "The defense rests," Cary said. Closing arguments are set for Thursday morning. The case then goes to the jury.